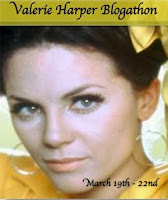 Classic TV Blog Association: Valerie Harper Blogathon! Valerie Harper has been a small screen mainstay since the early 1970s. She won our hearts with Rhoda and has remained there through numerous made for TV movies, her series Valerie and several guest appearances. Always a beautiful and welcome presence, several bloggers are celebrating her life and career from March 19th – 22nd. Please stop by madefortvmayhem.com for updates and links and feel free to write something yourself. Just post a link in the comments section. Next week is all about Valerie, so put on your favorite headscarf and join in the fun!